On August 15, 1977, SETI (Search for Extraterrestrial Intelligence) scientists detected the famous Wow! signal. This was a very strong narrowband radio signal that lasted 72 seconds, and for well over 30 years, it has continued to enthrall scientists. The Wow! 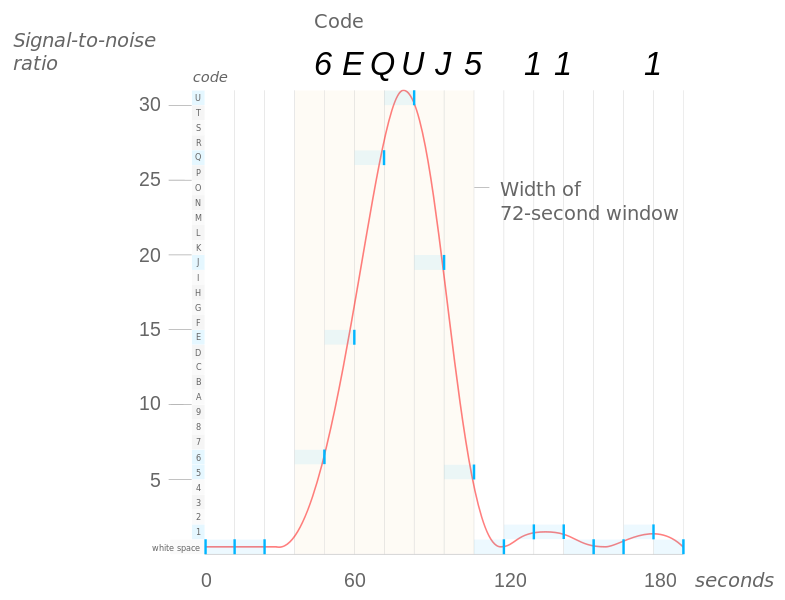 signal gets its name from a rather funny fluke. 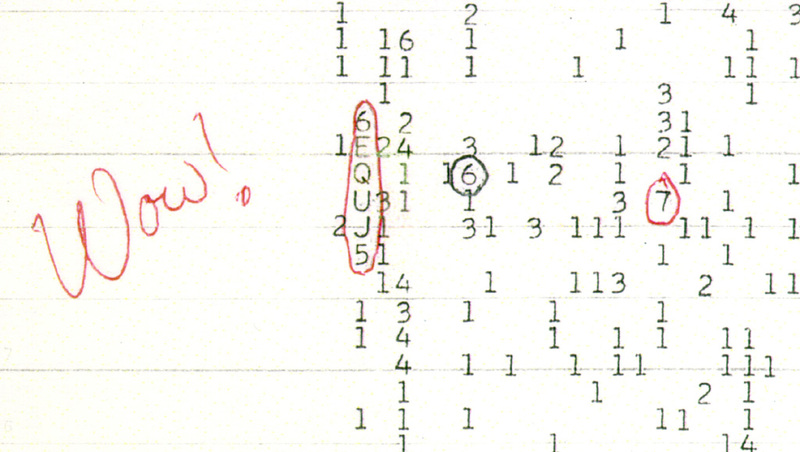 After discovering the signal, Jerry R Ehman (one of the SETI scientists) circled it and wrote “Wow!” next to it. For better or worse, the name stuck. The Big Ear was the telescope responsible for finding the Wow! signal. It consisted of two “feed horns” that pointed at a slightly different spots in the sky. We know that the Wow! signal was only detected by one of the two horns, unfortunately, the way Big Ear processed the data, there is no way to determine which horn actually detected the signal. To add insult to injury, the Big Ear was a fixed radio telescope, so it was a slave to the Earth’s rotation. It could only scan whatever section of sky it happened to be pointed it. Because of this, the Big Ear could only observe a section of sky for 72 seconds (which is precisely why the Wow! signal was only detected for 72 seconds). However, we do know a little something about the origins of the signal. After much research, astronomers were able to determine that the signal likely originated from the constellation Sagittarius, about 2.5 degrees south from Chi Sagittarii. Assuming there was a constant signal being transmitted by an alien race, for your first 36 seconds, we’d expect to see the signal increase in strength, and for the next 36 seconds we’d expect to see it decrease. In this respect, the graph that was created by the Wow! signal is almost exactly what we would expect to see from extraterrestrial communication. A plot of the Wow! signal, intensity over time. The signal has the code 6EQUJ5. A blank space on the print out has an intensity between 0 and 1. After that, 1-9 have intensities corresponding to the number (so a 2 has an intensity of 2.0). A-Z pick up where 9 left off (so, A has an intensity of 10.0, B of 11.0, and so on). There are two different frequencies that have been given, the lower value is 1420.356 MHz and the upper value is 1420.4556 MHz. The exciting thing about these frequencies is the hydrogen line is right in between them (1420.40575177 MHz).  The hydrogen line is the electromagnetic radiation spectral line that hydrogen creates when its energy state changes. Because this happens at such a high frequency, it’s hypothesized that extraterrestrials (or future space-faring humans?) might use the hydrogen line to communicate with each other. As you can imagine, that little patch of sky has been looked over with a fine toothed comb. Astronomers used the Big Ear to look for a repeat in the signal, but alas, they had no luck. In 1987 and 1989, astronomers used the META array and also came up empty-handed. The list of radio telescopes that have gone hunting for the second Wow! signal is very, very long. Topping the list is probably the Very Large Array and the 26 meter telescope at the Mount Pleasant Radio observatory, both of which are much more sensitive than the Big Ear. In the end, the Wow! signal is the only signal like this that has ever been detected. So, where did it come from? Well, it’s possible (but unlikely) that the signal was enhanced by Earth’s atmosphere. If you look at the stars, you’ll see them twinkle, this is because of “atmospheric twinkling” and a very similar mechanism that is known as “interstellar scintillation.” This could have enhanced the Wow! signal. However, as noted, this is one of the weaker explanations because it doesn’t explain how the signal would appear artificial or why we haven’t seen anything like it in subsequent surveys. Some astronomers believe the signal originated from Earth, and it was reflected back to us from a piece of space debris. But again, some of the pieces don’t fit. The 1420 MHz range is reserved for astronomical purposes and is thus restricted (terrestrial radio signals aren’t allowed to transmit on that frequency). The two possible locations for the origin of the Wow! signal. Assuming the signal was alien in origin, it’s possible the signal was a one-time burst (to see if anybody was listening, or to communicate with a ship/planet of theirs in our direction). It’s possible the signal was ongoing for some time, but stopped by the time that we got back to it (which would be an amazing stroke of bad luck for us). It’s possible that the signal is a sweeping transmission, scanning the sky to see if anybody is out there. However, many astronomers (including Ehman himself) don’t believe the signal actually came from extraterrestrials. 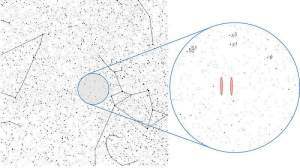 To summarize a statement by Ehman, he believes we should have seen something, anything, after looking for a recurrence of the signal so many times. And this does seem to be a rather just assertion. Ehman continues, “I refuse to draw vast conclusions from half-vast data.” We may never know what caused the Wow! signal. At the moment, the possibilities are too vast and the data too incomplete. In any case, when trying to sort all of this out, just remember- extraordinary claims require extraordinary evidence.